LaLa World, a blockchain financial system has launched to counter the inherent shortcomings and apprehensions of the traditional financial system to bring the underbanked and underserved population of the world into the financial mainstream. According to the firm, it aims to venture where “no banker has gone before” with its plans to touch the lives of the vast population of the world whose lives haven’t been affected by the global financial system. LaLa World has LaLa Wallet, a peer-to-peer ecosystem that aims to revolutionize the way in which people and micro and small businesses make transactions, payments and borrow money. It also aims to change how people buy insurance, remit money, perform daily transactions through cards (both virtual and physical) and buy banking products. There are still more than 2 billion unbanked people in the world. That is more than 25% of the global population. More than 50% adults in the poorest households are unbanked. How could one expect the global economy to fire on all cylinders when one in every four people in the world isn’t part of its financial system? Also, the traditional system’s over-dependence on physical processes and a cumbersome identification process makes it difficult for many people to have even a bank account, leave alone more complex financial transactions. The emergence and popularity of connected smartphones has offered a flexible, seamless and easy device to the financial systems to exploit and bring more people under the global umbrella. 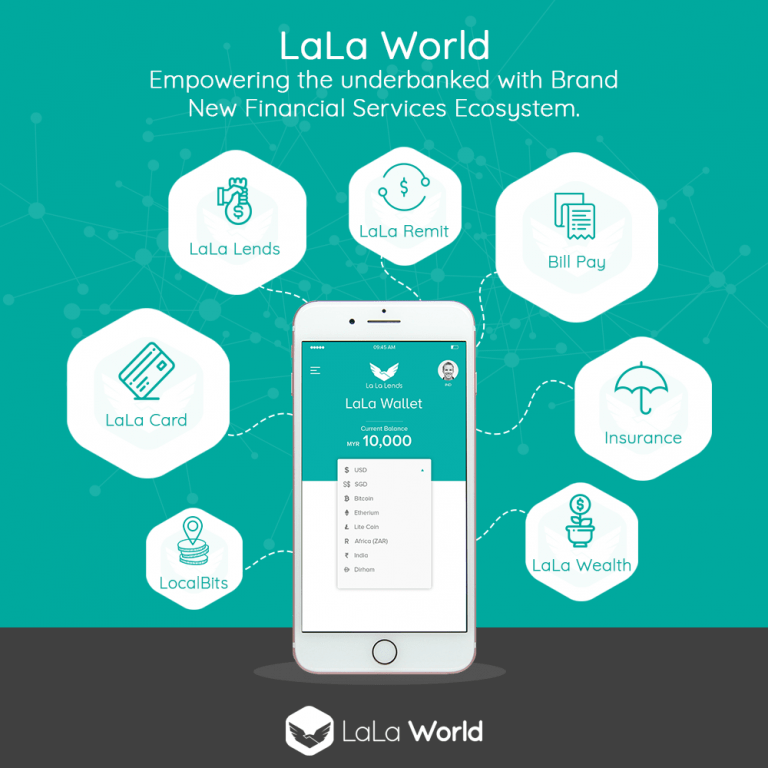 LaLa World appreciates the importance of such a connected technological device to join the millions of underbanked people to a unique financial ecosystem that is powered by blockchain technology. Anybody can own the LaLa Wallet on their smartphone and be connected with a world of opportunities and possibilities. The Wallet is secured by a global ID that includes state-of-the-art biometrics and physical identifications all digitized into a unique ID – LaLa ID. The Wallet allows peer-to-peer micro lending, affordable domestic and international remittances and daily financial transactions, all of which can be done using crypto or fiat assets. A digital card (debit and credit) can be used for any and all transactions that can be done with a traditional card but with the added advantage of very low or zero charges and with the opportunity to earn more crypto assets with every transaction performed. Yes, using LaLa Wallet is rewarding as much as it is easy. The World Bank believes that financial inclusion is a key enabler to reduce poverty and bring about prosperity. It has also charted out the Universal Financial Access Plan where it aims to bring about 100% financial inclusion by the year 2020. LaLa World has a unique business proposition, one that is driven not by profits but by the passion to reach every underbanked and underserved person in the world. It aims to be a true vehicle of financial inclusion. LaLa World is all geared up to bring this dream into reality.